At The Party Warehouse, we know how important it is that you throw your kids the best party they could ever have imagined! AA Milne’s Winnie the Pooh is a series that has been beloved by adults and children alike for generations, and now you can make these classic tales come to life with our party supplies for your kids. Whether you’re in love with Winnie the Pooh or your children go hopping mad for Tigger, our party supplies can turn your Pooh party into the best celebration it can be. We stock a great selection of Winnie the Pooh themed party supplies, whether you’re serving up cake on our Winnie Licious Plates or inviting the whole school with our vibrant invitations. To give your kids and their friends a real immersive experience, we also stock high quality Winnie the Pooh scene setters, which let you bring the animals of the Hundred Acre Wood into your home, and turn your everyday rooms into a woodland filled with new friends. 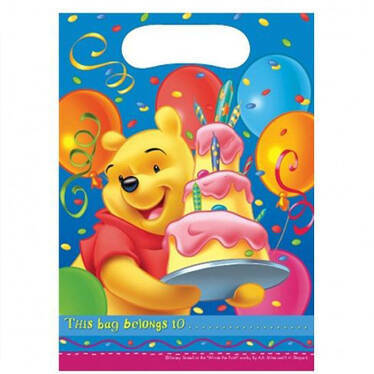 And to carry on the fun after the party, why not choose our Pooh-themed loot bags and pack them full of party gifts for your guests? All of our party supplies are sourced directly from the manufacturers, so you know that when you buy from The Party Warehouse, you’re getting the best quality supplies we can offer. So whether you’re looking for kids' party accessories or an entire stock to create your Winnie the Pooh themed wonderland, The Party Warehouse is the place for you! Includes Pack of 6 Invites. Includes Pack of 2 Winnie Scene Setters.